Four years have passed (and all "end of CYHSY" rumors have been laid to rest) since the release of Some Loud Thunder, and singer Alec Ounsworth & Co. are readying the arrival of their self released third record, Hysterical (due 9/20/11). "Same Mistake," the lead single from the highly anticipated new record, has the group returning to the straight-forward pop compositions of their debut and eschewing the more bizarre arrangements of Some Loud Thunder. While a pop-oriented sonic constitution may be considered traditional, so to speak, Ounsworth's characteristically unique vocals (a whiny, mumbly, and sometimes unintelligible howl that somehow just works) and the band's workmanlike delivery (very Cure-like here) make for a fresh and rocking new CYHSY tune that has us giddy for the new album. Listen to and nab "Same Mistake" for the mere expense of your e-mail address. 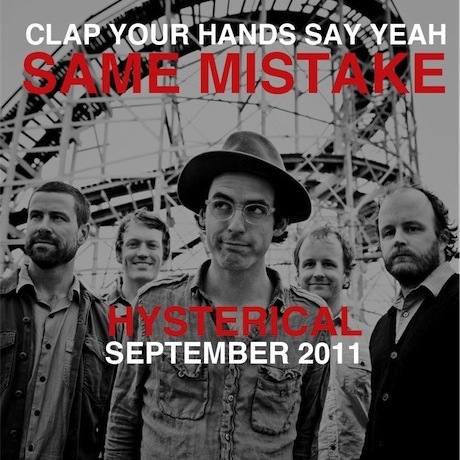 Get Hysterical on 9/12/11. BONUS - Have a look at a Hysterical promo vid below.